Mix cucumber pulp with lemon juice and apply to the face. Let it stay for 15-20 minutes and then wash with clean water. Take half a cup of besan (gram flour), 2 table spoon of turmeric powder, 2 table spoon of sandal wood powder, 2 tablespoons of almond oil, add some water to make a paste. Apply this paste to face and whole body and leave for 10-15 minutes. Rub with pressure with both palms and fingers to remove all the paste then rinse off with lukewarm warm water. Take an egg white in a bowl and thoroughly beat it. Mash half an avocado such that you get a soft pulp. Now put beaten egg, mashed avocado and a tablespoon of lime in a blender. Mix them well and apply this mixture on the face. After 15 minutes rinse it off. Apply Fuller’s earth(Clay or Multani Mitti) mixed with rose water and lemon juice. Once it gets dried wash your face with fresh water. To cure the problem of oily skin take one tablespoon of honey, 1 tablespoon of lemon juice and one egg white. Mix all the ingredients and apply this mixture to the face. Rinse off after 15 minutes. 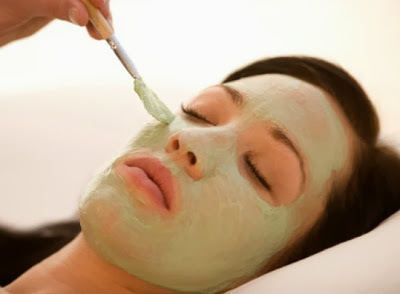 Make a mixture with gram flour(Besan) and Rose water and apply this on face for 15 minutes then rinse off with water. Mix sandalwood paste with rose water and Fuller's earth (multani mitti) and apply it on the face. Keep it for 15 minutes and wash it off with warm water then with cold water to close skin pores. Make a pulp of raw papaya and apply on Face and Neck. Papaya has a cleansing action, not only deeply cleanse your skin but also help a lot to cure oily skin. Curd (fat free or low fat) is an excellent cleanser. Apply it on the skin and rinse off after 15 minutes with lukewarm water . Juices of citrus fruits like Lemon, grapefruit, tangerine and orange, helps treat oily skin without the worry of harsh ingredients coming in contact with the skin.